As a child he used to have conversations in his parish church with Christ crucified. Entered the seminary in Parma, Italy at age 17. Ordained on 22 September 1888. Professor at the seminary. Vice-rector of the seminary. Vicar of Clergy in the diocese of Parma. Founded the Xaverian Missionaries on 3 December 1895; they were assigned by Rome to evangelize China. Archbishop of Ravenna, Italy on 9 June 1902. Resigned as archbishop due to poor health in October 1904. Coadjutor bishop of Parma, Italy and titular archbishop of Stauropolis on 14 November 1904. Archbishop of Parma, Italy on 12 December 1907. He visited his parishes regularly, worked for religious formation, supported religious education for the laity and lay involvement with youth. In 1928 he travelled to China to visit the Xaverians working there. Priest in the diocese of Berlin, Germany. He served in the Berlin Cathedral, and was well known in civic circles. An out-spoken critic of the Nazis and their anti-Semitism, Father Berhard organized protests outside the concentration camps, led public prayers for the Jews after the terrors of Krystallnacht, and filed formal complaints against the racist policies of the party. For these works he was imprisoned for two years. Upon his release he immediately resumed his ministry, both pastoral and social. He was arrested again, sentenced to the Dachau concentration camp, but died en route. Martyr. Augustinian canon regular. Deacon in 1094; ordained to the priesthood in 1101. Abbot of Cassan Abbey near Roujan, France in 1105. Bishop of Beziers, France in 1121. Spent all his diocese's revenues to care for the poor. Greek Catholic. Studied theology at Lviv, Ukraine. Ordained in 1908 at Przemysl (in modern Poland). Doctor of theology at Vienna, Austria in 1911. Professor at the Ukrainian seminary at Przemysl in 1913. Rector of the seminary. Auxiliary bishop of Przemysl, Poland on 16 May 1926. Arrested for his faith on 9 June 1946; sentenced to ten years at Vorkuta, Russia. Died in prison. One of the Martyrs Killed Under Communist Regimes in Eastern Europe. Lay woman in the archdiocese of Valencia, Spain. Baptized at the age of two days, and made her First Communion on 24 April 1904 in her home parish of Saint Peter the Apostle. Worked as a seamstress. Studied sociology; she worked with working young people, and brought the Salesian Sisters to the region in 1931 to help with the religious education of young people. She was devoted to Eucharistic adoration, regular Communion, and prayed the rosary every day. Member of Catholic Action. Martyred in the Spanish Civil War. French noble in the reign of King Dagobert I. Friend and spiritual student of Saint Ouen of Rouen. Bertille wanted to enter religious life, but delayed and worried, thinking her parents would oppose her choice; they did not. Benedictine nun at the convent at Jouarre, Brie, France, an abbey founded by Saint Owen's brother Ado under the strict rule of Saint Columbanus. Infirmarian. Convent school headmistress. Prioress. 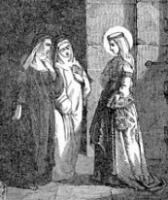 Abbess of the abbey at Chelles from 646, when it was restored by Saint Bathildis, until her death. During this time the convent attracted nuns that included a queen, several Merovingian princesses, and many Anglo-Saxon noble women. Priest at Saint Wojciech parish, Poznan, Poland. Arrested in the Nazi anti-Catholic sweeps of 1939 and sent to the Catholic clergy section of the Dachau concentration camp. There he continued his ministry by caring for other prisoners and suffering his own privations in quiet dignity. Martyr. Married at age 20. Priest in the Armenian church. In 1696 he and his family made complete submission to the authority of Rome. This angered Armenian officials who took this as an insult. Some of them falsely accused Gomidas of being a spy for Rome, which led to his arrest and execution by Turkish authorities. Considered a martyr as his death was the result of his faith. 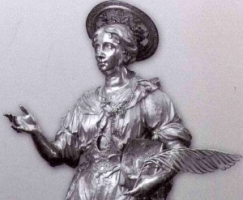 Saint Galation was a Christian married to Epistemis, and brought her to the faith. 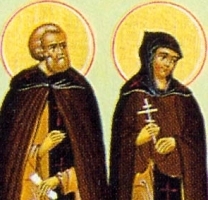 They both then retired to monasteries and were later martyred in the persecutions of Decius. It's possible they were fictional, the story of their lives being written as fiction but misunderstood as fact; however, married couples agreeing to enter religious life was not unusual at the time. Dominican. Priest. Promoted the use of the Rosary to strengthen the faith of Christians. Imprisoned in the persecutions of emperor Tu-Duc, he ministered to other prisoners until he was executed. Martyr. Monk from age 12. Priest. Spiritual advisor to Saint Leonard of Noblac. Born to the nobility. Ministered in Devon and Cornwall, where Landkey is named for him, and in Brittany where he was known as Quay. Physician condemned to work the mines during the persecutions of Maximian. Martyr. Born to the southern German nobility, Idda spent as much of her time in prayer as possible. Married. Widowed, she spent her final days at the Benedictine abbey of Fischingen, Germany. Monk at Moyenmoutier, France. Friend of Saint Hidulf. Founded the monastery of Bégon-Celle (now known as Saint-Blasien) in France. Benedictine monk at Salcedo, diocese of Tui, Spanish Galatia. Helped Saint Rudesind spread the Benedictine Rule throughout northwest Spain. Sixth century Benedictine monk. Dispatched by Saint Benedict of Nursia to found a monastery in Terracina, Italy. Bishop condemned to work the mines during the persecutions of Maximian. Martyr. Abbot of a monastery in Trier, Germany. Bishop of Trier. Brother monk of Saint Winwallus and Saint Giacuto at Landevennec monastery in Brittany, France. Abbot. Founder of Llanganten abbey, Powys, Wales. Daughter of a prince of Constantinople. Hermitess in the desert of Jordan. Four young Christian men who were martyred together in the persecutions of Maximian - Aussenzius, Philotheus, Timothy and Theotimus. A body of clerics regular organized for Apostolic work, following a religious rule and relying on alms for their support. It was the chief instrument of the Catholic Reformation. Pope Paul III approved the new rule in 1540, and Ignatius was elected the first general of the order in 1541. The constitutions, drafted by him and based on his Spiritual Exercies were adopted in 1558. It was the first order which enjoined by its constitutions devotion to the cause of education. The ministry of the Society consists chiefly in preaching; teaching catechism; administering the sacraments; conducting missions in parishes; taking care of parishes; organizing pious confraternities; teaching in schools of every grade; writing books, pamphlets, periodical articles; going on foreign missions, and special missions when ordered by the pope. The general resides at Rome, Italy and has a council of assistants. The motto of the Society is Ad Majorem Dei Gloriam (For the greater glory of God).